Digital games are a popular way to market foods and beverages to children and teens. Games used to market foods fall into two main categories: (1) food and beverage company-produced advergames for children and (2) the integration of food and beverage marketing into the videogaming experience of older children and teens. Advergames target children and are defined by the Federal Trade Commission (FTC) as "games designed to promote a particular product ... [that are] sometimes based on television commercials, using similar or expanded storylines, and tend to use animated depictions of the food or proprietary characters associated with particular brands. "1 Advergames are featured on food company websites and also come in the form of mobile apps that children can play on smartphones, iPod Touch devices, and tablets. The FTC's 2012 report of food industry marketing expenditures found that "[a]dvergames ... were often a key focus on child- or teen-oriented websites.2 Companies spent an estimated $676 million to produce advergames in 2009.3 Advergames also are promoted on retail food packaging to prompt a purchase or a purchase request to a parent. A 2009 study of food and beverage brands that maintain designated children's areas online found that 85% of the websites examined featured advergaming.4 Here we focus on the tactic of tying advergames to codes on retail food packaging to drive purchases and consumption of unhealthy food and beverage products. A 2013 study conducted in the Netherlands tested the impact of playing advergames on the caloric intake of children.11 The study found that playing advergames featuring food, including games featuring fruit, cued children to eat. While marketers design their advergames to promote consumption of one particular food product, the study found that the actual effect of food-themed advergames was that children ate not only brand-specific food but also whatever other energy dense products were available to them in greater quantities than they did after playing non-food themed games.12 The study findings were consistent with prior research into the impact of television commercials on eating behavior. Researchers noted, however, that when children play advergames the marketing exposure to the food brand is longer than watching a 30-second television ad and that this likely is part of the reason why the study found such strong effects on food intake from advergames.13 The health harm of increased food consumption after playing advergames is compounded by the fact that the actual act of playing an advergame is a sedentary behavior. Another approach taken by 20% of the websites analyzed was to induce a purchase by tying a product purchase "directly to the quality of the website experience. "15 This is typically done by placing codes or virtual tokens on retail food product packaging to be entered on the food marketing website in order to "unlock" exclusive content or to access additional levels of game play. Food companies reported to the FTC that they offer "codes found in or on food packages — enabling [players] to advance to higher levels. "16 For example, each McDonald's Happy Meal package contains an "mCode" to enter on www.McWorld.com to gain access to special features.17 Children are prompted to visit McWorld on the product packaging and prompted to enter mCodes on the website (Figure 1). 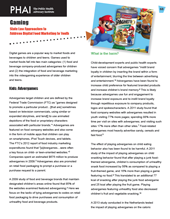 Food industry market research submitted to the FTC also revealed that "[promotions] that were simple and easy to access, or offered instant gratification, such as using a code to play a game online, were appealing to kids ...."18 Thus, advergames are an effective marketing tool to drive purchases of unhealthy food products. Children perceive advergames as a form of entertainment as opposed to marketing. Since 2010, food-related advergames produced by four different food companies have been cited by the Children's Advertising Review Unit (CARU), a self-regulatory body of the Council of Better Business Bureaus, for running afoul of its guideline against blurring the line between advertising and content.19 The practice, however, remains ubiquitous and relatively unchanged. CARU enforcement action involving advergames centers on the websites where advergames are accessible to children as opposed to the retail packages directing children to the advergames. The remedy for a CARU violation involving an advergame under the CARU self-regulatory framework has been to include the language "this is advertising" on the website. The disclaimer itself may be above the reading level of many young children and/or beyond their comprehension. The Kellogg Company's frootloops. com website was cited by CARU for failing to adequately disclosure that its advergames were in fact advertising.20 The company added a grey rectangle stating "This is advertising from Kellogg's" to satisfy CARU's guidelines (Figure 2). The disclaimer was placed in the lower right hand corner outside of the main viewing area of the advergame and the use of grey stands in sharp contrast to the electric color scheme of the rest of the content on the website. Moreover, the actual substance of the game appears to remain unchanged. Advergames are material to the purchase of unhealthy food products because they include direct inducements on retail food packaging and/or on food company websites to purchase products in exchange for some perceived benefit to the target child consumer. Direct inducements to purchase linked to advergames are not reasonably avoided by children because they do not recognize the inducement as marketing but rather an opportunity to play an entertaining game or to access something special on a website or a mobile app. The health harm caused by playing advergames — the powerful cuing effect on eating behavior — cannot be avoided by children because it is deeply subconscious. Advergames present no countervailing benefit to consumers or competitors. Advergames also offend the established consumer protection law principle prohibiting deceptive marketing to consumers under the guise of entertainment or newsin other words marketing in ways that a reasonable member of the target audience likely will not recognize as marketing.25 Advergames violate this established consumer protection principle because children perceive advergames as entertainment and not as marketing. Direct inducements to make food product purchases tied to advergames also are deceptive because children do not recognize advergames as a form of marketing. This means that they are likely to be misled into wanting to purchase products in order to play games. A perceived barrier to protecting children from unfair and deceptive marketing like the tying advergames to direct inducements to purchase unhealthy foods and beverages is that parents make the ultimate purchase decision for many child-oriented food products. Marketing tactics that are designed to get children to nag their parents to purchase products are commonly referred to as pester power marketing. For a detailed analysis of how state consumer protection law can be used to address pester power marketing please refer to PHAI's Pester Power Marketing Legal Issue Brief. Food-themed advergames have been repeatedly cited by CARU, yet remain commonplace and relatively unchanged. Advergames' detrimental impact on child health is supported by sound research. The FTC's review of food marketing expenditures found extensive use of advergames by food marketers. State action to address this unfair and deceptive practice is warranted. Gaming presents a particularly lucrative opportunity for marketers to reach the teen market. Gaming takes place on multiple platforms such as computers, mobile devices (smartphone, iPod Touch, tablet, etc. ), handheld game consoles (Nintendo 3DS) and internet-enabled game consoles like Nintendo's Wii, Sony's PlayStation, and Microsoft's Xbox . The games themselves come in the form of apps, downloads, online streaming or physical media for gaming systems such as portable game cartridges or discs. Two-thirds of U.S. households play computer or video games,26 and in 2011, U.S. sales of games, hardware, and other accessories topped $24 billion.27 In 2013, global sales are projected to reach $66 billion.28 More than 82% of teens consider themselves "gamers,"29 and nearly one-third of all players are under 18,30 up from one-quarter in 2010.31 Among 13-24-year-olds, gaming is the most popular content accessed online.32 In the U.S., 40% of all time spent using mobile apps is spent playing games.33 Food and beverage companies can establish multi-faceted relationships between their products, the games themselves, and the sub-culture of gaming enthusiasts known as "gamers." These relationships benefit all the industries involved, driving young gamers' engagement not only with food and beverage products, but also with the games and related accessories. Recent research into the impact of gaming on child and adolescent health demonstrates a connection between electronic games, being overweight and obesity.34 A 2004 Swiss study found a nearly two-fold increase in the risk of obesity for every hour children in grades 1-3 spent playing electronic games daily.35 A 2011 study conducted in Denmark, found preliminary evidence that playing a video game for one hour is accompanied by a greater caloric intake in adolescent males when compared to relaxing in a comfortable chair for an hour.36 Interestingly, subjects who had played electronic games ate more without feeling increased sensations of hunger and appetite.37 Given the large percentage of teens that play online games, there is great potential for unhealthy food and beverage marketing exposure while gaming. Food marketing integrated into the gaming experience may have an even greater impact on caloric intake — prompting more purchases and consumption of foods high in calories and low in nutritional value. Food and beverage companies maximize their appeal to the young gamer demographic by investing in key aspects of gaming culture. PepsiCo. 's Mountain Dew has long marketed itself as "game fuel." In 2011, the company released "Game Fuel: Citrus Cherry" to cross-promote the release of the popular first-person shooter game "Call of Duty: Modern Warfare 3. "38 Dr. Pepper sponsors Major League Gaming, a professional gaming organization, and an Internet-based reality series about gamers who have their home gaming systems replaced with the newest gaming consoles and large flat-screen TVs.39 Energy drink companies and brands also market to gamers. Coca-Cola's NOS energy drink sponsors Major League Gaming,40 and devotes an entire section of its website to gamers.41 Using the tagline, "NOS Fuels Gamers," the webpage includes news on upcoming games and player events and tips on how players can maximize their performance in various games. Gaming is a huge segment of youth entertainment that has been infiltrated by food and beverage marketing for items of poor nutritional quality. The number of games, gaming apps and gaming platforms makes monitoring of food marketing in the gaming world a real challenge for state regulators. Future efforts to monitor food marketing and to protect young consumers from harmful food marketing should take care to include gaming. Excerpted from State Law Approaches to Address Digital Food Marketing to Youth by Cara Wilking, JD; Mark Gottlieb, JD; Melinda Bonacore; Andrew Cheyne, C.Phil; Pam Mejia, MPH, MS; Lori Dorfman, DrPH; Jeffrey Chester, MSW. December 2013, Public Health Advocacy Institute, Inc., Berkeley Media Studies Group and Center for Digital Democracy. Support for this research was provided by a grant from the Robert Wood Johnson Foundation's Healthy Eating Research Program (#69293). 1 Fed. Trade Comm'n, A Review of Food Marketing to Children and Adolescents: Follow-Up Report 70 (December 2012), http://www.ftc.gov/os/2012/12/121221foodmarketingreport.pdf. 3 Jennifer L. Harris et al., US Food Company Branded Advergames on the Internet: Children's Exposure and Effects on Snack Consumption, 6 J. Children Media 51, 52 (2012). 4 Anna E. Henry & Mary Story, Food and Beverage Brands that Market to Children and Adolescents on the Internet: A Content Analysis of Branded Web Sites, 41 J. of Nutrition Educ. and Behavior 353, 355 (2009). 6 Jennifer L. Harris et al., US Food Company Branded Advergames on the Internet: Children's Exposure and Effects on Snack Consumption, 6 J. Children Media 51 (2012). 11 Frans Folkvord et al., The Effect of Playing Advergames that Promote Energy-Dense Snacks or Fruit on Actual Food Intake Among Children, 97 Am. J. Clinical Nutrition 239 (2013). 16 Fed. Trade Comm'n, A Review of Food Marketing to Children and Adolescents: Follow-Up Report 70 (December 2012), http://www.ftc.gov/os/2012/12/121221foodmarketingreport.pdf. 17 McWorld, Frequently Asked Questions about McWorld on Happymeal.com, http://www.happymeal.com/en_US/downloads/fAQ.pdf. 18 Fed. Trade. Comm'n, A Review of Food Marketing to Children and Adolescents: Follow-Up Report 88 (December 2012), http://www.ftc.gov/os/2012/12/121221foodmarketingreport.pdf. 19 Press Release, Children?s Advertising Review Unit, CARU Recommends Spangler Revise ?Dum Dum? Website to Clearly Disclose That Games, Activities are Advertising; Company Agrees to Do So (Dec. 17, 2010), http://www.caru.org/news/2010/CARUDumDumPR.pdf; Press Release, Children's Advertising Review Unit, CARU Recommends Topps Modify Website to Cleary Disclose Advertising, Company Does So (Mar. 30, 2011), http://www.asrcreviews.org/2011/03/caru-recommends-topps-modify-website-to-clearly-disclose-advertising-company-does-so-2/; Press Release, Children's Advertising Review Unit, CARU Recommends Kellogg Modify 'Froot Loops' Website to Better Disclose Advertising Within Games, Activities (Aug. 27, 2012), http://www.asrcreviews.org/2012/08/caru-recommends-kellogg-modify-froot-loops-website-to-better-disclose-advertising-within-games-activities/; Press Release, Children's Advertising Review Unit, CARU Recommends IHOP Modify 'IHOP.com' Website to Better Disclose Advertising Within Game (Sept 12, 2012), http://www.asrcreviews.org/2012/09/caru-recommends-ihop-modify-ihop-com-website-to-better-disclose-advertising-within-game/. 20 Press Release, Children's Advertising Review Unit, CARU Recommends Kellogg Modify 'Froot Loops' Website to Better Disclose Advertising Within Games, Activities (Aug. 27, 2012), http://www.asrcreviews.org/2012/08/caru-recommends-kellogg-modify-froot-loops-website-to-better-disclose-advertising-within-games-activities/. 21 Federal Trade Commission Act, 15 U.S.C. 45(n) (2006). 23 CaloricCalculator, www.caloriccalculator.org (last visited Sept. 11, 2013). 24 Leonard H. Epstein et al., A Randomized Trial of the Effects of Reducing Television Viewing and Computer Use on Body Mass Index in Young Children, 162 Archives of Pediatrics & Adolescent Med. 239 (2008). 25 For an excellent summary of case law related to stealth marketing see Center For Digital Democracy, et al., Complaint and Request for Investigation of PepsiCo's and Frito-Lay's Deceptive Practices In Marketing Doritos to Adolescents, (Oct. 19, 2011), http:///digitalads.org/sites/default/files/publications/digitalads_ftc_complaint_2011.pdf (last visited September 12, 2013). 26 Entertainment Software Association, Essential Facts About the Computer and Video Game Industry: 2010 Sales, Demographic and Usage Data 4 (2010), http://www.theesa.com/facts/pdfs/esa_essential_facts_2010.pdf. 28 Alan Feuer, Seeking to Be Both NFL and ESPN of Video Gaming, N.Y. Times, Aug. 9, 2013, at MB1, available at http://www.nytimes.com/2013/08/11/nyregion/seeking-to-be-both-nfl-and-espn-of-video-gaming.html?pagewanted=1&_r=0&hp. 29 Initiative Media, In-Game Advertising, http://www.initiative-newsroom.de/wp-content/uploads/2010/07/Initiative_In-Game_Advertising_FINAL.pdf, (last visited Aug. 9, 2013). 30 Entertainment Software Association, Essential Facts about the Computer and Video Game Industry: 2012 Sales, Demographic, and Usage Data 11 (2012), http://www.theesa.com/facts/pdfs/esa_ef_2012.pdf. 32 Google, Hyper connected Teens ( 2012), http://nnsahc.org/images/uploads/10-_HyperConnectedTeens.pdf. 33 Dan Laughlin, The Gamification of Mobile Games, Flurry Blog (Dec. 13, 2012), http://blog.flurry.com/bid/92377/The-Gamification-of-Mobile-Games. 34 Munni Ray & Kana R. Jat, Effect of Electronic Media on Children, 47 Indian Pediatrics 561,563 (2010); Margaret Schneider, et al., Media Use and Obesity in Adolescent Females, 15 Obesity 2328, 2333 (2007); Maria M. Carvalhal et al., Overweight and Obesity Related to Activities in Portuguese Children, 7-9 Years, 17 European J. Pub. Health42, 44-45 (2006); Jorge Mota et al., Obesity, Physical Activity, Computer Use, and TV Viewing in Portuguese Adolescents, 17 PediatricExercise Science 113, 119 (2006); but see Elizabeth Wack & Stacey Tanleff-Dunn, Relationships Between Electronic Game Play, Obesity, and Psychosocial Functioning in Young Men, 12 Cyber Psychology 241, 243-244 (2009), available at http://online.liebertpub.com/doi/pdf/10.1089/cpb.2008.0151 (study of college-aged males finding that electronic game play was not directly linked to obesity, decreased academic performance, or social impairment and acknowledging that the study findings were contrary to research on electronic gaming and young children). 35 Nicolas Settler et al., Electronic games and Environmental Factors Associated with Childhood Obesity in Switzerland, 12 Obesity Research 896, 901 (2004). 36 Jean-Phillippe Chaput et al., Video Game Playing Increases Food Intake in Adolescents: A Randomized Crossover Study, 93 Am. J. Clin. Nutr. 1200 (2011). 38 Steve Tanner, Review: Mountain Dew Game Fuel 2011 — Tropical, BevReview (Oct. 18, 2011), http://www.bevreview.com/2011/10/18/mountain-dew-game-fuel-2011-tropical/. 39 Major League Gaming, Premiere! Dr. Pepper Ultimate Gaming House, http://tv.majorleaguegaming.com/video/premiere-dr-pepper-ultimate-gaming-house-season-4-episode-2--WjBxb1BNZ2liS2c=, (last visited Aug. 12, 2013). 40 Major League Gaming, NOS: Performance Center, http://www.majorleaguegaming.com/nos (last visited Aug 12, 2013). 41 NOS Energy Drink, http://www.drinknos.com/gaming.do (last visited Aug.12, 2013). 42 Karl Greenberg, Doritos Goes Viral for "Crash" Campaign, MediaPost News (Jan. 6, 2012), http://www.mediapost.com/publications/article/165320/. 43 Josh Larson, 6 Steps to Market Your Brand in Games, iMedia Connection (Sept. 6, 2006), http://www.imediaconnection.com/content/11093.asp. 44 Initiative Media, In-Game Advertising (2010), http://www.initiative-newsroom.de/wp-content/uploads/2010/07/Initiative_In-Game_Advertising_FINAL.pdf. 46 Redbull.com Team, Red Bull Kart Fighter 3 About to Launch, Redbull Blog (Aug. 7, 2013), http://games.redbull.com/int/en/blog/red-bull-kart-fighter-3-about-to-launch. 47 XBOX, Red Bull Crashed Ice Kinect (2013), http://marketplace.xbox.com/en-US/Product/Red-Bull-Crashed-Ice-Kinect/66acd000-77fe-1000-9115-d80258411253. 48 Christopher Heine, Red Bull's Xbox videos Garner 14-Minute Engagement Rate: Uses its Roster of Athletes to Get Brilliant Results, AdWeek (Aug. 9, 2013, 8:31 PM), http://www.adweek.com/videowatch/red-bulls-xbox-videos-garner-14-minute-engagement-rate-151781. 51 Stuart Elliott, Dude, This Video Game Promotion is Sweet, Media Decoder Blog (Aug. 24, 2011, 1:00 PM), http://mediadecoder.blogs.nytimes.com/2011/08/24/dude-this-video-game-promotion-is-sweet/. 53 Josh Larson, 6 Steps to Market Your Brand in Games, iMedia Connection (Sept. 6, 2006), http://www.imediaconnection.com/content/11093.asp. 54 Andrew Adam Newman, Slim Jim Gives Snackers Something to Play For, N.Y. Times, Oct. 11, 2012, at B3, available at http://www.nytimes.com/2012/10/12/business/media/slim-jim-and-ea-give-snackers-something-to-play-for.html?_r=0&adxnnl=1&adxnnlx=1374520810-WMs1lePtFrHwG5vAVvib4w. 58 Steve Watts, Taco Bell Giving Away PlayStation Vitas, Shack News (Jan. 11, 2012, 9:45 AM), http://www.shacknews.com/article/71928/taco-bell-giving-away-playstation-vitas. 59 Ken Hoffman, Drive-thru Gourmet: Taco Bell's Five Buck Box, Fork and Cork Blog (Feb. 10, 2010), http://blog.chron.com/forkandcork/2010/02/drive-thru-gourmet-taco-bells-five-buck-box/. 60 GameSpot Forums: I've Been Eating Nothing But Taco Bell 5 Buck Boxes Every Day, http://www.gamespot.com/playstation-vita/forum/ive-been-eating-nothing-but-taco-bell-5-buck-boxes-every-day-61778430/ (last visited Sept. 10, 2013). 61 Larry Hyrb, Win a Special Mountain Dew & Doritos Xbox One Promotional Package (June 13, 2013, 9:13 PM), http://majornelson.com/2013/06/13/win-a-special-mountain-dew-doritos-xbox-one-promotional-package/. 62 William Usher, Doritos and Mountain Dew Giving Away Thousands of Xbox One Consoles, Gaming Blend(June 14, 2013, 1:31 PM), http://www.cinemablend.com/games/Doritos-Mountain-Dew-Giving-Away-Thousands-Xbox-One-Consoles-56742.html. 64 Admin, Target Watch: Video Games, Doritos, and Mountain Dew, Sins Blog (Aug. 31, 2013), http://sinsblog.com/2011/11/23/target-watch-video-games-doritos-and-mountain-dew.